Process for 15 seconds at high speed until smooth. Set aside in the refrigerator for at least 30 minutes to allow the flavors to blend and process once again before serving. Pour mixture into small bowl (I used a small empty tuna can) and top with a layer of caviar. Where does the name Mojito come from? I push through the local dance club. It’s full. It’s hot. It’s dark. To the right and left of me, before and behind me, there is a mass of sweat-soaked bodies in all possible shades of skin colour. They dance the Rumba, Son, and Cuban Reggaeton, also called Cubaton. Liquid flows out of every pore. The air is so thick you could cut it with a knife. I need to get out of here. I finally make it. My head is pounding as I leave. Why is everything so bright? It has got so late… Or is that early? Whatever. The street is empty. I feel dizzy. I wonder how many mojitos I've drunk in the last few hours in this dance club. Was it six? Seven? Eight or more? 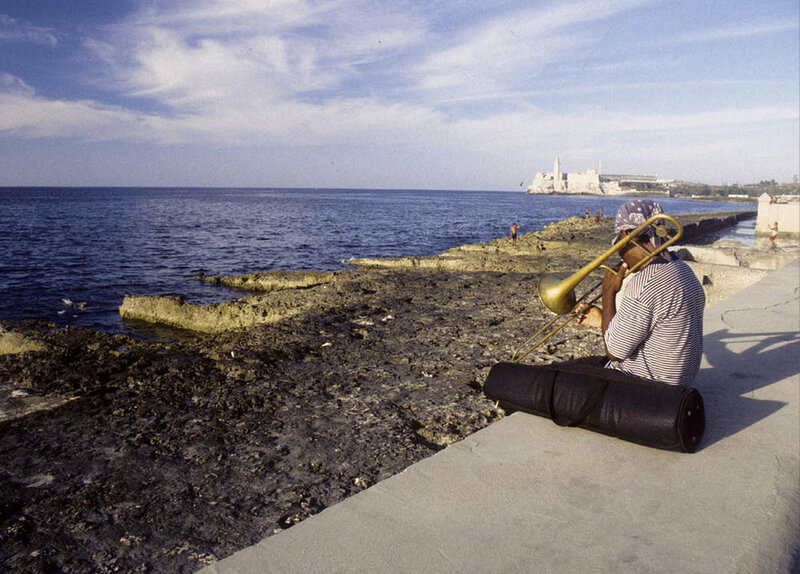 Swaying, I walk down the street to the Malecón, Havana's seaside promenade. Hopefully the breeze of the sea will do me a world of good and I want to see the sea before I finally go to sleep. It has been a long day. It all started at 10 o'clock this morning in a bar in the centre of Havana... with a Mojito. Moros y Cristianos or Congrí. The cuban version of rice and beans. “I couldn't really say where you can drink the best mojitos in Havana", says Guillermo, who like me, is from the Canary Islands and works since a couple of years as Hotel Manager in Miramar, a quarter of Havana. He had a few hours free for me today and so we're sat in the bar in the Calle Obispo. 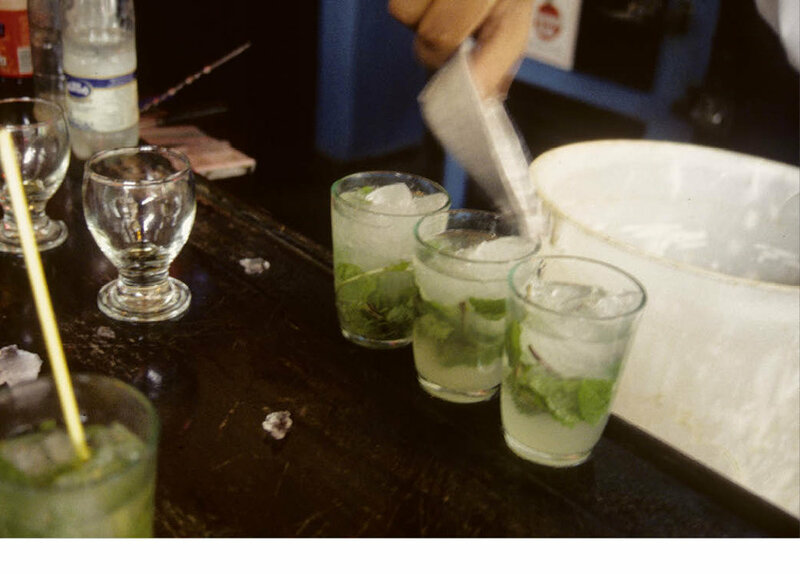 "In Havana, you can drink good mojitos pretty much everywhere. He reckons that in the Bodeguita del Medio the mojitos are famous because of Ernest Hemingway, but they taste the best where there is a good mood and atmosphere". There appears to be an excess of good mood in the ‘La Lluvia Dorada’ bar. The guests, a mix of tourists and locals, drink and dance to the live music. There is flirting and some groping, and it is not even lunchtime. On the orders of Guillermo, the bar keeper served me a mojito, while Guillermo himself quickly downed his morning coffee. I look at the man behind the bar slightly puzzled. "Don't worry! When you're dancing, you'll sweat the mojito right out", he adds with a wink. "You're an ‘Isleño’ as well aren't you, like Guillermo?" asks the waiter, apparently having already recognised my dialect. The descendants of expatriate inhabitants of the Canary Islands – which belong to Spain – are lovingly called "Isleños" (literally, "those who came from the Islands”) in Cuba, which sounds a little strange given that Cuba itself is an island. In Cuba, the Isleños and their descendants form a large community. Canarian Spanish, which is known as the gentler form of Spanish dialects (and which very often uses the diminutive "-ito"), contains a number of Portuguese loanwords, including among other Mojo, originating from the Portuguese molho. In Portugal, molho is a specific sauce consisting of olive oil, salt, water, wine vinegar, garlic, paprika, chillies, and various spices such as cumin and coriander, all prepared with a mortar. Portuguese seafarers brought Molho sauce to the Canary Islands, which was modified in Spanish to Mojo. Since then, Mojo sauce has played a large role in Canarian gastronomy (Mojo Picón is with pepper, and Mojo Verde with coriander). Mojo Canario (Canary Island Mojo) arrived in Cuba with the Canary expats and turned into Mojo Cubano (Cuban Mojo), which is prepared with garlic, onions, olive oil, oregano, salt and a mixture of the juice of limes and oranges. In the Caribbean, these fruits are much more common than the wine vinegar used in the original recipe from the Canary Islands. The Mojo Cubano is a sauce or marinade that is served with Lechón asado (grilled pork), grilled chicken and many other meat dishes, and of course there are almost as many variations of Mojo Cubano as there are Cubans on the island: Mojo Criollo, Mojo Tomate, etc. are just a few of the famous varieties. So where did the original name for mojito come from? Some sources say that the name Mojito also has Canary roots, just like Mojo Cubano sauce. Canarian expats to Cuba worked in the sugar cane plantations where sugar cane was processed into rum. One theory goes that the word for the drink comes from "Mojadito" (something wet) and from there it became Mojito (Wikipedia: "...the name Mojito is simply a derivative of mojadito (Spanish for "a little wet") or simply the diminutive of mojado ("wet"). Due to the vast influence of immigration from the Canary Islands, the term probably came from the mojo creole marinades adapted in Cuba using citrus vs traditional Isleño types"). But "Mojadito" (something wet) makes little sense to me. More so, I think that "Mojito" derives from “Majadito" (with an "a" instead of an "o" after the M). "Hacer un Majado" or “Majadito" in the Spanish dialect of the Canary Islands means "something crushed”, and that's exactly what you do if you want to prepare a "Mojo" sauce in a mortar. When preparing a mojito, you lightly crush the mint leaves in the glass, most often using a spoon. In this way, you can clearly see how the progression from “Majadito” to “Mojito” is made. Because people speak very quickly in the Canary Islands, they end up swallowing their letters and even whole syllables when speaking out loud — in Cuba they do that too — so that a word like “Majadito” quickly becomes shortened to “Majaito”, which then mutates to the much shorter version of “Mojito”. The name Mojito is thereby a diminutive form of something in a compressed form. “Today I’ll drink and be patriotic" I say to Guillermo after explaining my mojito theory and already feeling the urge to get my dancing feet on the floor. The band was simply so good and carried everyone along with it. "Okay, so if you're interested in mojitos, then come to the hotel bar this evening where we are about to test the new cocktail menu, including the classic one and some other unusual variations on mojitos. You can also eat typical Cuban food in the restaurant as well". And so that was the story of how I ended up testing various mojitos and eating mango soup and grilled chicken with Mojo Cubano in Guillermo’s hotel restaurant, before then moving on in the early hours to a different bar where I drank six or seven, mojitos. Or eight or more. Add one part of Havana Club Añejo 3 Años and the ice cubes.